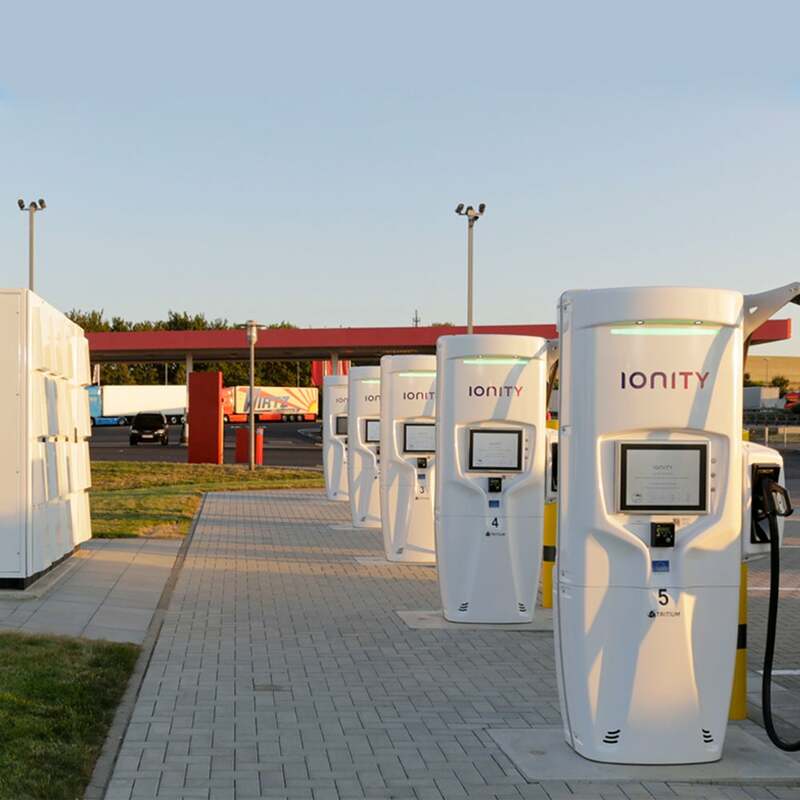 Need a high power charging system that can serve many EV drivers at the same time? 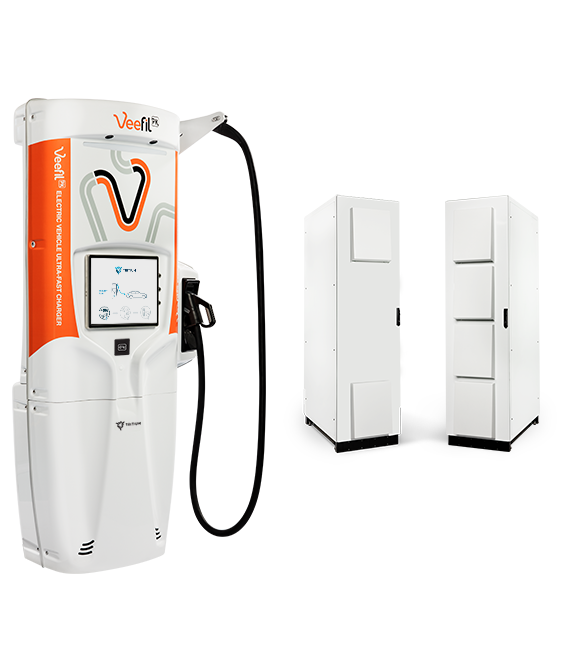 The Veefil-PK high power charging system operating at 350 kW can add 350 kilometres (217 miles) of range to an electric vehicle . The Veefil-PK high power charging system operating at 175 kW can add 175 kilometres (109 miles) of range to an electric vehicle. Available now! Contact Us today. The system’s unique advantages include small footprint, scalability, flexibility and high efficiency. 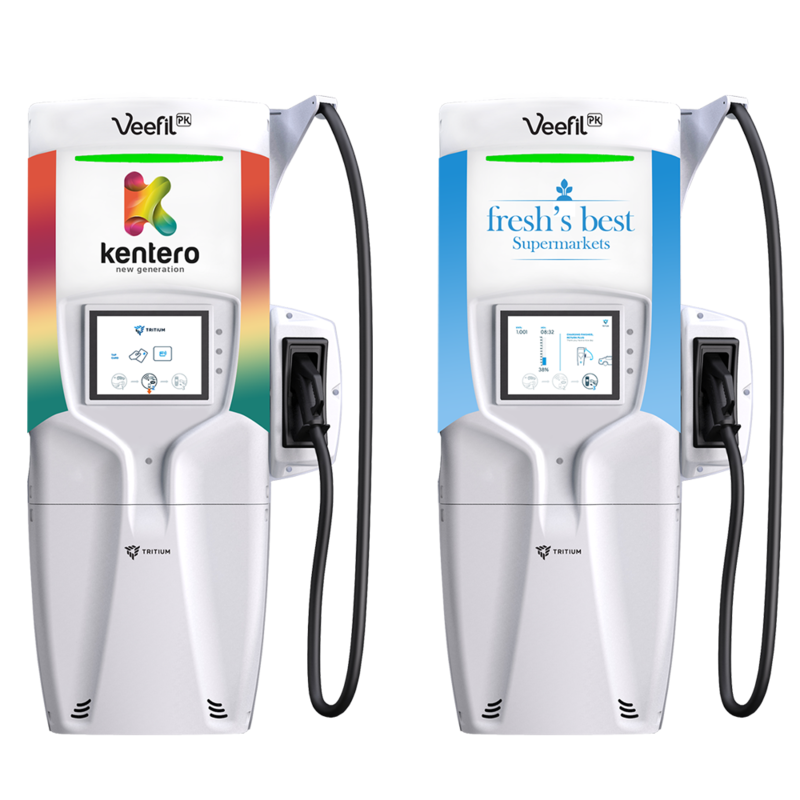 The Veefil-PK is ideally suited to traditional fuel stations, motorway rest stops and convenience stores. A PK system with several user units will replicate the traditional fuel station experience. 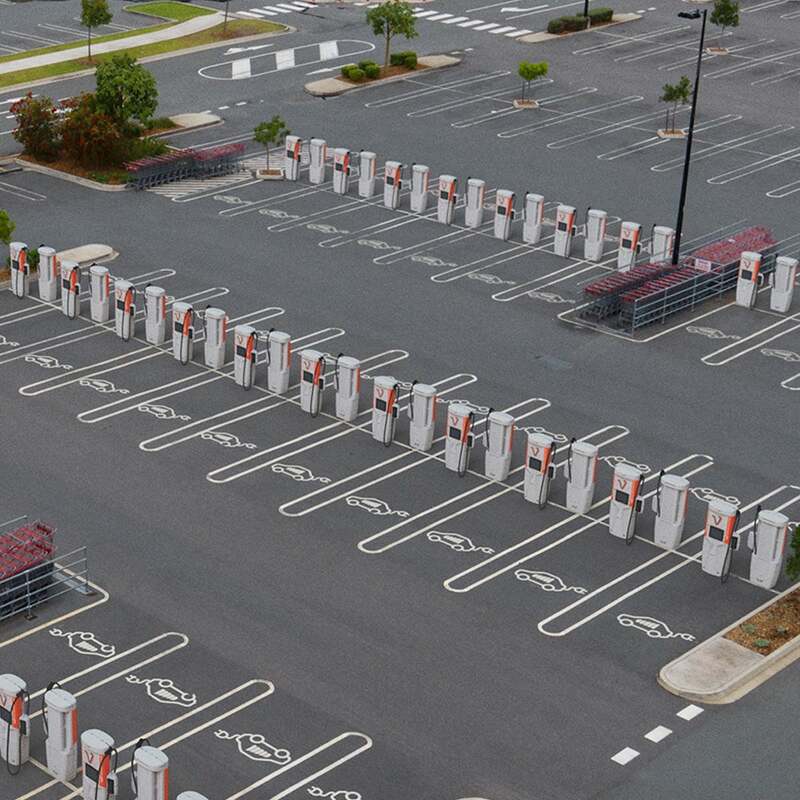 Because the EV charging experience is hands-free, drivers can leave their vehicles while filling, and utilize adjacent amenities. This hands-free experience allows for the overall fueling station visit to take a similar amount of time as a traditional fuel station experience. The image shows Tritium's PK system installed at a motorway rest stop, Brohltal-Ost, Germany. The small footprint of the Veefil-PK makes it ideal for any location, especially where real estate is at a premium. Tritium's architecture reduces electricity losses. The system is designed to minimize the isolation points–the fewer isolation points, the less loss. High voltage transfer management via a DC bus. Our products deliver very efficient removal of heat from the system, reducing energy losses. Proven liquid cooling inside the user unit ensures the longevity of the power electronics and leads to high levels of efficiency. The image shows Tritium's PK system at a shopping destination. Drivers can leave their vehicles to charge while shopping and the system owner can generate revenue from this business opportunity. The modular layout of the Veefil-PK system makes it flexible and the technology makes it scalable to suit the needs of the owner. The small footprint allows the system to fit easily into existing sites. The user units have a slim design and small footprint. The small footprint allows the system to fit easily into existing sites. The system is scalable by adding more power units as demand grows with increased site utilisation or advances in technology. Each power unit powers one or two user units depending on the desired configuration. Add more power to a power unit and add more power units as needed to upgrade sites. The image shows one of many possible configurations of Tritium's PK system. This layout is specific to Europe. The user units have a slim design and small footprint. 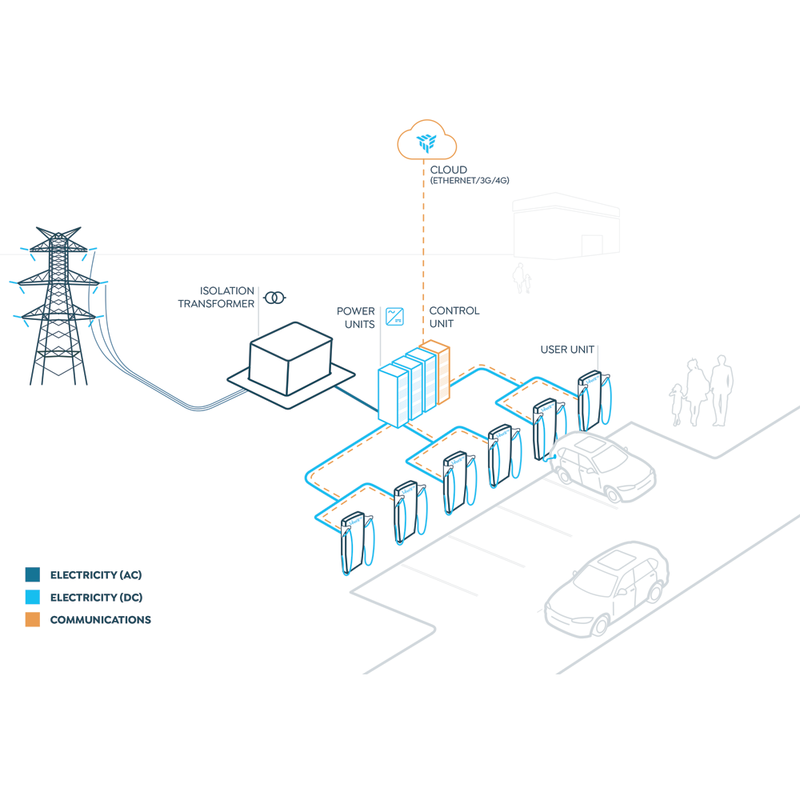 Two user units can operate on one power unit, and the system is scalable by adding more power units as demand grows with increased site utilisation or advances in technology. The user units operate on proven liquid cooling technology and it is also possible to add your own branding. Each power unit powers up to two user units. These power units can be placed independently from each other. The control unit is the central control system for site power and load management. It contains the communication unit that connects with your chosen provider's back end via the cloud. Want to know how the Veefil-PK can be adapted for your location and business model? Tritium can help design your high power charging system. Communicate your brand and amplify the impact of your chargers with eye-catching graphics. The front decals of the Veefil-PK user units can be customised and used as a branding opportunity , using your own company logos, colours and messages. Find out more! Contact Us today. Copyright Tritium Pty Ltd � All Rights Reserved.